Fox and Chernin Entertainment's "Hidden Figures" had another triumphant weekend, taking in $8.5 million on Saturday for an estimated $20.5 three-day weekend and a projected $25.3 million holiday weekend. Illumination and Universal's hit "Sing" came in second, with a three-day gross of $13.8 million and estimated four-day gross of $18.5 million, bringing its domestic cumulative up to $237.7 million. "La La Land" will come in third this holiday weekend, grossing another $5.8 million at 1,848 locations in North America, including 148 IMAX screens. The studio is reporting a three-day gross of $12 million and a projected four-day gross of $14.2 million, which would bring its cumulative total up to $77.1 million domestically. Disney's "Rogue One: A Star Wars Story" also had another strong weekend in its fifth run at the box office. Having earned $498.9 million domestically so far, the "Star Wars" prequel grossed an estimated $13.8 million over the three days and $17.2 million over the four days. STX Entertainment's "The Bye Bye Man" over performed this weekend and took in an estimated $13.38 million, with it on track to gross $15 million over the four-day holiday weekend. The movie took in another $4.8 million on Saturday, with the production house anticipated another $3 million on Sunday and another $1.6 million on Monday. The film, co-financed by Los Angeles Media Fund, was directed by Stacy Title while Jonathan Penner adapted the script from the short story "The Bridge to Body Island" by Robert Damon Schneck. It was produced by Intrepid Pictures' Trevor Macy, who created the idea of "The Bye Bye Man" after reading a horror anthology novel titled "The President's Vampire." Its CinemaScore is C while its Rotten Tomatoes score is at 27 percent. Mark Wahlberg's "Patriots Day" is estimated to have earned $14.25 million this holiday weekend after grossing another $4.36 million on Saturday night. This is in line for weekend estimates of $15 million, although box office analysts had predicted a $20 million opening weekend earlier this week. The movie, also starring John Goodman, J.K. Simmons, Kevin Bacon and Michelle Monaghan, has a CinemaScore of A+ and a Rotten Tomatoes score of 79 percent. Ben Affleck's "Live By Night" took in an estimated $5.4 million over the three-day weekend after adding another $1.9 million on Saturday. Directed by Affleck, the film also stars Elle Fanning, Sienna Miller and Zoe Saldana and a 32 percent RT rating with a CinemaScore of B. Paramount isn't expected to have a good MLK weekend, with "Monster Trucks" looking to earn just $14.1 million over the four days ($10.5 million over three days) against a $125 million budget. In September, the studio's parent company Viacom reported a $115-million write-down for a movie believed to be "Monster Trucks." Heading into the weekend, the studio had anticipated a $8 million to $10 million opening weekend estimate. However, the film has a CinemaScore of A. The studio's other film, Martin Scorsese's "Silence," expanded nationwide this weekend to 747 theaters and earned $1.9 million over the three days and is expected to gross $2.3 million over the four days. The film's budget was in the mid-$40 million range, and its cumulative through Monday is estimated at $3.4 million. It stars Andrew Garfield, Adam Driver and Liam Neeson and has a Rotten Tomatoes score of 84 percent. Lastly, Open Road Films released their new film "Sleepless," starring Jamie Foxx, Michelle Monaghan and Gabrielle Union. With the budget around $30 million, the production company is expecting around $10 million for the four-day weekend ($8.5 million over the three days). Its Rotten Tomatoes score is 11 percent and the movie has a CinemaScore of B+. In what’s shaping up to be a highly competitive holiday weekend at the box office, 20th Century Fox and Chernin Entertainment’s “Hidden Figures” has the No. 1 spot, just three days in. If it holds, it will be the reigning film for the second week in a row. 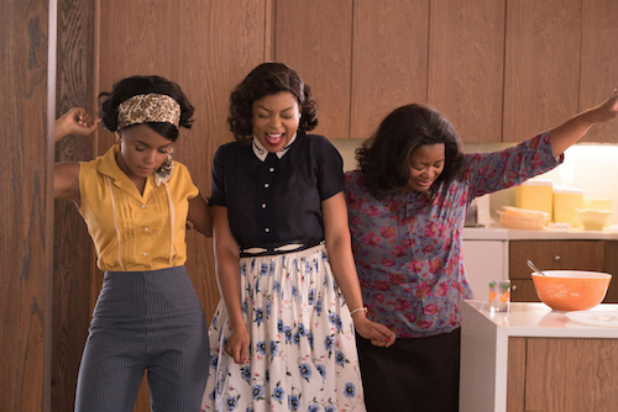 The film, based on a true story about black women at NASA who were integral to the Space Race, brought in an estimated $20.5 million in the U.S. and Canada during the traditional three-day weekend. The studio is projecting that the film, starring Taraji P. Henson, Octavia Spencer and Janelle Monae, will end the four-day Martin Luther King Jr. Day weekend with $25.3 million. “Hidden Figures” is set to hit $60 million domestically by Monday. Lionsgate’s musical “La La Land” took second, expanding to more than 1,800 screens (including almost 148 Imax screens) in its sixth week in release. The Emma Stone-Ryan Gosling love story and ode to Los Angeles pulled in $14.5 million in three days. On the heels of the movie’s sweep of all seven of the Golden Globes it was nominated for last week, the studio is projecting a four-day gross of $17.5 million. If this holds, the estimated domestic gross for the film will be $77.1 million. Landing in third was Universal’s “Sing,” in its fourth week. The animated musical garnered $13.8 million through Sunday. The studio is projecting $18.5 million through Monday. To date, the film has pulled $237.7 million domestically. Lucasfilm-Disney’s “Rogue One: A Star Wars Story” landed in fourth in its fifth week with an estimated $13.8 million over three days. It’s projected to pull in $17.2 million over the four-day weekend. The picture is on its way to the coveted $1-billion mark, with $980 million in ticket sales worldwide. Faring the best of the new releases was STX Entertainment’s “The Bye Bye Man” which landed in the fifth spot. Over-performing tracking predictions, the thriller pulled $13.4 million through Sunday. It is expected to creep past $15 million over the full holiday, which would be more than double its $7.4-million production budget. Audiences (61% females; 75% under 25) and critics appear split of the picture. Although moviegoers gave it a B CinemaScore, it has a 27% Rotten Tomatoes rating. Following its successful three-week limited run in seven theaters, CBS Films and Lionsgate’s “Patriots Day” expanded to more than 3,000 locations. Starring Mark Wahlberg, the retelling of the 2013 Boston Marathon bombing story took in $12 million for the three-day weekend, landing in sixth place. Analysts project the holiday weekend could end with it pulling in a total of $18 million to $20 million. The film from Peter Berg seems to be an audience and critics favorite. It received a rare A-plus CinemaScore rating and has a 79% Rotten Tomatoes score. Big flops came in the form of new releases “Live By Night,” from Warner Bros., and “Monster Trucks,” from Paramount. “Live,” which was written and directed by and stars Ben Affleck, expanded nationwide following a three-week limited run. Based on a novel by Dennis Lehane, the Prohibition-era crime thriller will likely fail to meet analyst projections of $10 million during the four-day weekend. It only brought in $5.4 million through Sunday. “Live By Night,” which cost an estimated $65 million to make, has been hampered by poor reviews. “Monster Trucks” pulled in $10.5 million in its three-day debut. But the film was produced for a massive $125 million. This makes the movie, about a teenager whose truck is inhabited by a tentacled, computer-animated monster, an early 2017 dud for the studio. Still, it will beat analyst projections of $8 million to $10 million for the entire weekend. The studio is projecting $14.1 million. Also opening was “Sleepless” from Open Road. Starring Jamie Foxx, it amassed $8.5 million over the three-day weekend. If projections hold, it will meet analyst expectations of $10 million over four days. Labors of love, one from Martin Scorsese, the other from Ben Affleck, proved costly at a casualty-strewn weekend box office where the uplifting NASA drama Hidden Figures stayed on top for the second straight week. Hidden Figures, about female African-American mathematicians in the 1960s space race and starring Taraji P. Henson, Octavia Spencer and Janelle Monae, earned $20.5 million for the Martin Luther King Jr. Day holiday weekend, according to studio estimates Sunday. The weekend was more remarkable for what didn't work than what did. Both Affleck's period gangster thriller Live by Night and Scorsese's religious epic Silence bombed in their wide-release debuts. Live by Night, adapted from Dennis Lehane's novel, earned a mere $5.4 million in 2,471 theaters. Silence, from Shusaku Endo's historical novel about 17th-century Jesuit priests in Japan, took in $1.9 million in 747 theaters. Live by Night was Affleck's directorial follow-up to the best-picture winning Argo, while Scorsese's Silence is the epitome of a passion project, representing a three-decade culmination of the director's investigations into the nature of faith. While the film, starring Andrew Garfield and Liam Neeson, earned considerable respect from some critics, it failed to catch on in Hollywood's awards season. The most costly flop may have been family film Monster Trucks. It earned $10.5 million but cost $125 million to make. 0 Response to "‘Hidden Figures’ Orbits 2nd Straight Box Office Victory"